If you’re a fan of Vhils, you should probably hit up the EDP Foundation in Lisbon, Portugal. Not only is the Portuguese street artist exhibiting his show “Dissection” there through Oct. 5, but he’s also dropped a kickass mural right next to the museum. Adorning the curvature of an adjacent cylindrical structure, Panorama has viewers spell-bound by its intricate majesty. 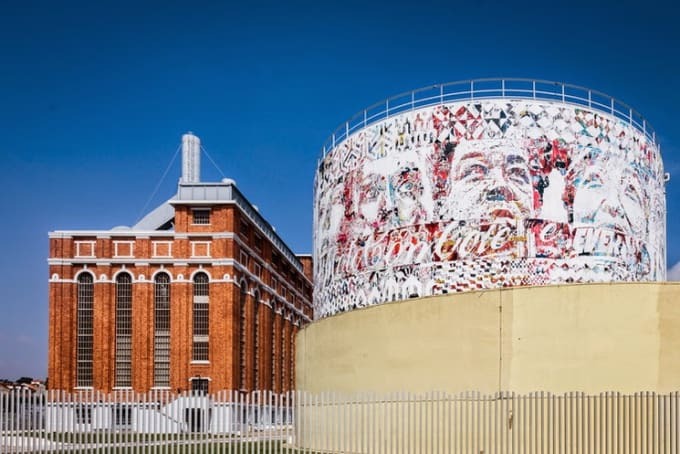 The 360-degree piece is a “symbolic round-up” of all his previous works to date from every city Vhils has worked in. Multi-colored patterns, portraits, and text reflect the many places he’s visited. While the subject matter is certainly diverse, the artist seems to be hinting to us that our once-rich cultures are becoming similar and bland.